Fireworks season is upon us as I write this, so I thought I’d post some advice for dog owners whose biggest dog behaviour problem is that they have a dog scared of fireworks. I like sound therapy CD’s for dog firework fear. But, as ever with dog behaviour improvements, it’s HOW you do it rather that what you use. I have a dog training CD which I bought on Ebay for £8 with several firework and other loud noises in its soundtracks. Play the tracks whilst the dog is eating but at a very low level – almost imperceptible, in fact. The dog begins to associate the sound with something good – food – rather than the usual negative associations of fear or guarding responses. Over a period of a couple of weeks, raise the volume little by little so that you finish with normal sound levels for fireworks and the dog happily eating away. The trick is to increase sound levels by such small increments that the dog doesn’t react. This kind of technique is known to a dog behaviourist as counter conditioning. Alongside a pheromone spray, you might like to consider a little herbal help (For the dog not you, incidentally – and not THAT kind of herbal.. Ahem!). Valerian and Skullcap remedies can help to calm your dog. I’m not aware of any scientific studies into them (Always willing to hear if you know different), but the subjective evidence is that they may help in low-level cases of fireworks anxiety and will not do any harm at the recommended doses. Vet-prescribed drugs such as Zylkene may also help, but usually only in conjunction with the right behavioural techniques. Complimentary therapies such as Reiki can certainly help too. 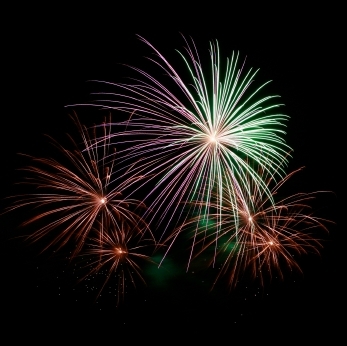 Lastly, at night try to make sure that your dog has had their walk before fireworks start going off. Let them have a big walk in the morning and a short one when you get home from work, for example, so that you can avoid being out walking a dog when they go off. (Don’t stop walking the dog just because the dark nights are here, by the way – that’s not fair!) Find your dog a nice place in the middle of the house and make sure windows are closed to minimise noise. Leave the radio or TV on if you go out. If your dog does show a frightened response, DON’T hug and cuddle them or try to reassure them with your voice as you might for a frightened human child. You risk making it much worse. In essence, you reinforce the unwanted behaviour by rewarding it with affection. It’s hard not to – It goes against out instincts. If you’d like to know more, and how you MUST react for your dog to overcome their fear of fireworks – or any other fear reaction – please contact The Dogfather to discuss a booking today so that we can sit down over a cup of tea to plan the way forward for you and your dog/s. I’m sure I can help. Like people, dogs are all individual!